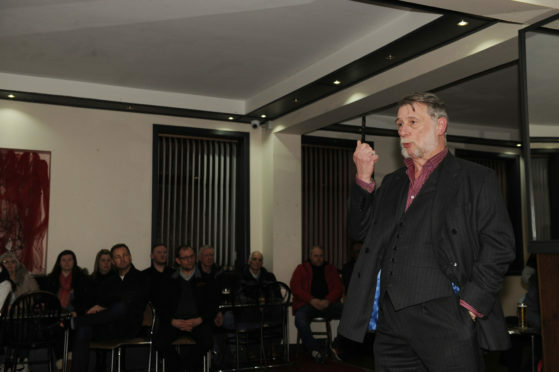 Chairman Donald Findlay QC addressed supporters on Thursday night. The Blue Brazil are fighting for survival in League Two and seeking to avoid dropping into the Lowland League, but the 137-year-old club is also fighting to survive in a far more literal sense. Windfall cup receipts have helped in recent seasons, but officials recently confirmed it has been kept afloat largely due to fundraising and regular cash injections from fans who are the club’s directors. That situation is unsustainable, and Mr Findlay urged everyone at a specially arranged public meeting in the town’s Junction Bar on Thursday night to do what they can to rally round. Mr Findlay revealed that directors had held an extraordinary general meeting earlier this week during which they pledged to continue to manage and maintain the club no matter its league status next season, and committed to giving positive and practical backing to a new action plan to take the club forward under the banner of ‘Honour the Past, Ensure a Future’. “The purpose of this meeting is not to confirm the demise of Cowdenbeath FC, and I can also say that the rumours some notable people have contributed substantial sums of money are not true – if that was the case then we would not be here,” he said. “Not very far from here was a house I lived in and when I was growing up there were stories that were told to me by my father. “One was about mining and a sense of community. The other was about Central Park and the football club. “Central Park is well named for a good season because it sits right at the very heart of the town. “We’re not going to let the club die but if we’re going to take it forward we need people to come forward. “I have this foolish notion of the club and the community getting more involved together. “If I was to say now “That’s it, I’m shutting the club, we’re not going to play the game on Saturday”, we would get people coming from every direction wanting to become involved in the club. Supporters were urged to back the Club 135 initiative, which is a plea to every fan or person with a link to Cowdenbeath to donate a minimum of £10. Reaching out to at least 13,500 people globally would raise at least £135,000 to provide some security moving forward, and the meeting heard that £35,000 has been raised in eight months – with contributions coming from the likes of Vietnam, Canada and the USA. However, despite new investors, a new ground, council assistance and joint ventures among the options considered, those associated with the club have concluded that there is no “white knight” on the horizon. The club has suffered in more recent years from dwindling home attendances, with Cowden having the lowest average crowd of the 42 Scottish clubs, and it has not recouped significant transfer income despite some of its players going on to bigger and better things. Gate income from home games this season is barely likely to exceed £28,000, which will not go far in the current football climate. The club also lost ownership of its Central Park home in 2010, and it receives nothing in the way of income from renting out the ground to accommodate stock car racing and a weekly market. “When we took over the club was in some peril – there was no team, there was no manager, there was very little. “With a lot of hard work, that was turned around and we started doing very well. “We won a championship, we played in the Championship, and the club benefited from what is brought by playing at a higher level. “But when you start to slide there is a danger that the slide can become very difficult to arrest. “The lower you go the less attractive you are to players, to managers, to coaches, to sponsors and to other commercial interests. “We have decided that our approach should be to move forward, because the other choice is to operate a strategy of containment, trying to fend off another year of relegation, and eventually that will bite you, you will bumped out of the SPFL and end up in the Lowland League. “We have decided that we need to be ambitious and try to take the club forward.